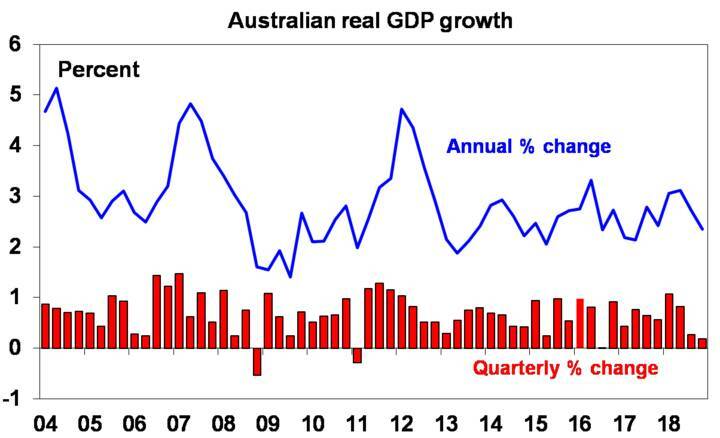 Much has been made of Australia’s nearly 28 years without a recession. 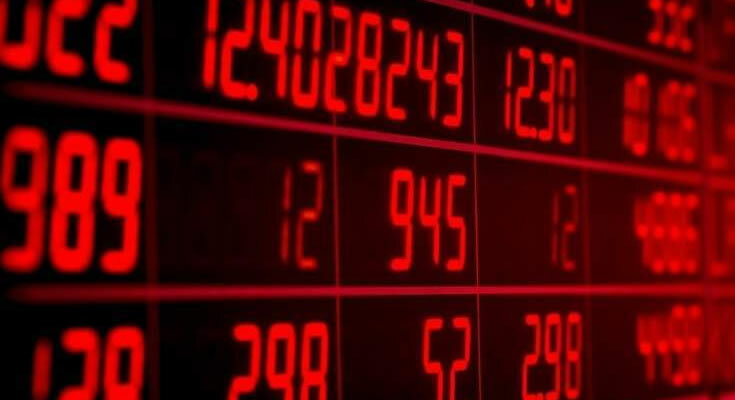 Despite many seeing recession as inevitable in response to the 1997 Asian crisis, the 2000-2003 tech wreck, the GFC and the “end” of the mining boom Australia has seemingly sailed on through each of these regardless. 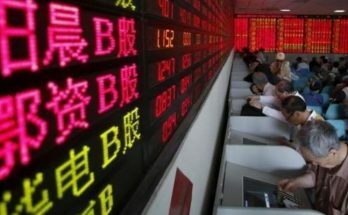 This has been thanks to a combination of economic reforms in the 1980s and 90s, the floating $A that falls whenever there is a major global problem providing a shock absorber, strong growth in China, desynchronised cycles across industry sectors and states, strong population growth and good luck. The question now is whether Australia’s luck has run out with housing turning down (and less economic reform in recent times)? While we see a constrained period for Australia as housing turns down, we still don’t see recession (albeit it’s a risk). December quarter GDP growth was just 0.2% quarter on quarter, with a fall in housing investment, weak consumer spending and business investment and a detraction from trade only partly offset by solid public demand. Coming on the back of just 0.3% growth in the September quarter this is not good news. It means growth has slowed to 2.3% over the year to December and, even worse, annualised growth over the last six months has slumped to just 1%. 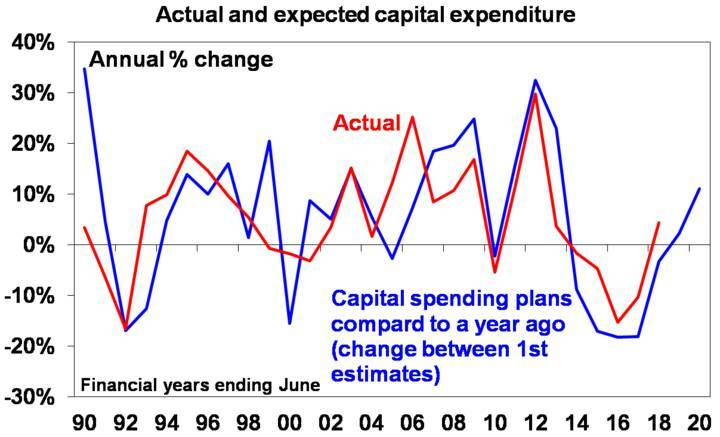 It also means Australia has slipped into a “per capita” recession with GDP per person now falling for two quarters in a row, for the first time since 2006. The bad news is that growth is likely to remain under pressure as the housing downturn intensifies. 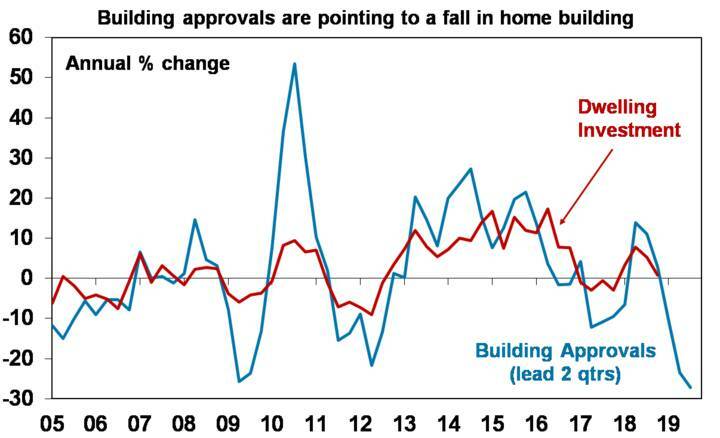 Approvals to build new homes have fallen sharply. And while auction clearance rates have bounced at the start of the year we doubt this is the start of a recovery in house prices given the long list of negatives for house prices including: tight credit; the switch from interest only to principle and interest loans; record unit supply; issues around new building quality; an 80% or so collapse in foreign demand; fears that negative gearing and capital gains tax arrangements will be made less favourable if there is a change of government; and falling prices feeding on themselves. We see Sydney and Melbourne home prices falling another 15% or so as part of a total top to bottom fall of around 25% out to next year, which will see national average home prices have a top to bottom fall of around 15%. So far we are only about half way there. a direct detraction from growth as the housing construction cycle turns down. This is likely to amount to around 0.4 percentage points per annum (which was what it added on average during the construction boom). reduced demand for household equipment retail sales as dwelling completions top out and decline. a negative wealth effect on consumer spending of around 1-1.2% pa. Rising housing wealth helped drive decent growth in consumer spending in NSW and Victoria as households reduced the amount they saved as their housing wealth rose. This is now likely to go in reverse detracting around 0.7 percentage points from GDP growth. there could also be a feedback loop into further bank credit tightening if non-performing loans and defaults rise as unemployment starts to rise. The east coast drought could also act as an ongoing drag on growth with a “mild” El Nino hanging around although this may be mild at around a 0.2 percentage point growth detraction. 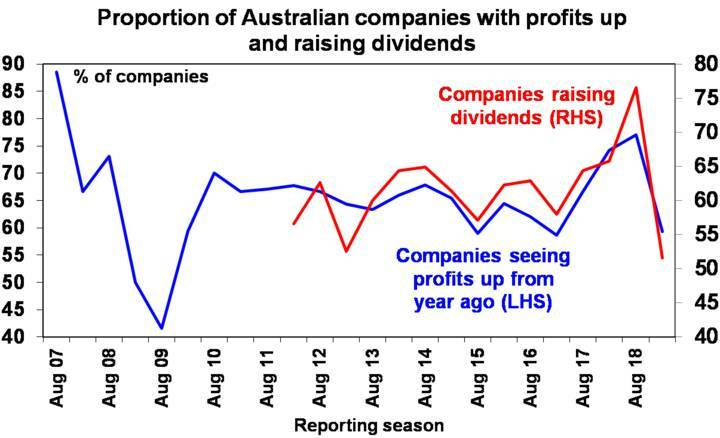 The weakness in relation to the domestic economy is evident in in weak profit results for domestically exposed companies in the recent December half year profit reporting season. While results were better than feared enabling shares to rise, the ratio of upside surprise to downside was its weakest since 2009, only 59% saw profits rise from a year ago and only 52% raised their dividends from a year ago which (notwithstanding “special” dividends from a few companies) indicates a lack of confidence in the outlook. While consensus expectations for profit growth for this financial year held at 4%, this was only because of an upgrade to resources profit growth to 14% with profit growth in the rest of the market falling to just 1%. 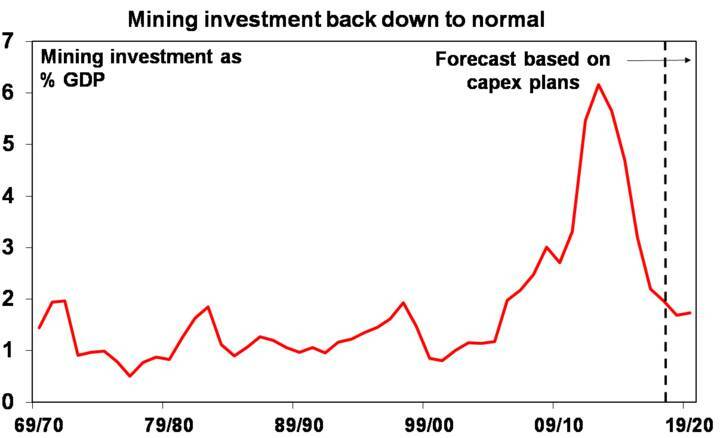 First, the drag on growth from slumping mining investment (which averaged around 1.5 percentage points per annum) is fading as mining investment is close to the bottom. Second, surveys point to a recovery in non-mining investment. Business investment plans for next financial year are well up on plans a year ago. Third, public infrastructure spending is rising solidly. 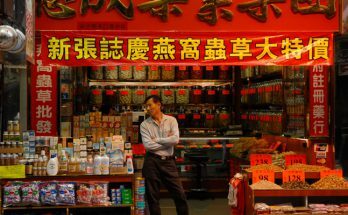 Fourth, demand for our exports is likely to improve through this year as global growth picks up led by China in response to stimulus measures and a likely fading of trade war risks. 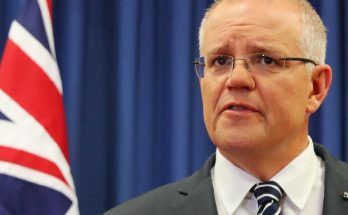 Finally, policy stimulus is likely to help with the April Budget and election outcome likely to see some combination of tax cuts or increased spending (under Labor) from July and the RBA likely to cut interest rates. Given the cross currents, we have revised our growth forecasts down to around 2-2.5% over the next year or so. So we see some pick up from the dismal second half 2018 pace and no recession but growth will still be well below potential and RBA forecasts. Growth around 2-2.5% won’t be enough to further eat into spare labour market capacity let alone absorb new entrants to the workforce so we see unemployment rising to around 5.5% by year end. This is consistent with slowing job vacancies already becoming evident. This in turn points to wages growth remaining weak. Meanwhile, it’s hard to see much uptick in inflationary pressure. 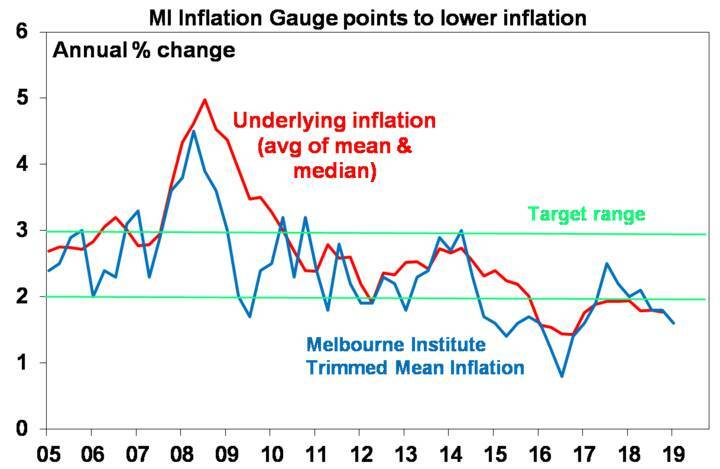 The latest Melbourne Institute Inflation Gauge points to ongoing weakness in underlying inflation. 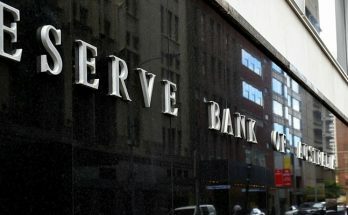 Against the backdrop of soft growth and inflation we continue to see the RBA cutting the cash rate to 1% this year. Rate cuts won’t be aimed at reinflating the property market but supporting households with a mortgage to offset the negative wealth effect. And banks will likely have no choice but to pass the cuts on given the bad publicity of not doing so. 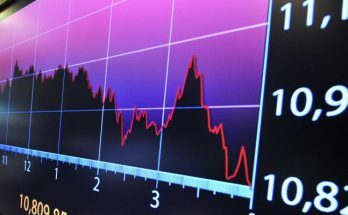 For investors this all means: bank deposit rates will remain poor; Australian bonds will continue outperforming global bonds; Australian shares are likely to remain relative underperformers compared to global shares as the housing downturn weighs; and with the RBA likely to cut and the Fed on hold the $A is likely to fall into the high $US0.60s. Dr Shane Oliver, Head of Investment Strategy and Economics and Chief Economist at AMP Capital is responsible for AMP Capital's diversified investment funds. 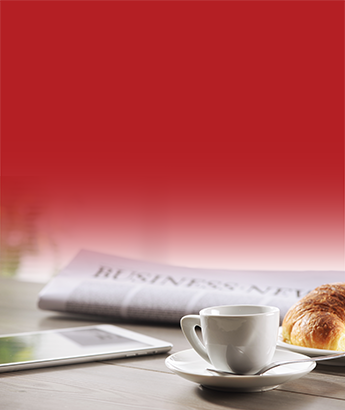 He provides economic forecasts and analysis of key variables and issues affecting all asset markets.